399 Marlborough is located on the north side of Marlborough, between Hereford and Massachusetts Avenue, with 397 Marlborough to the east and 401 Marlborough to the west. 399 Marlborough was designed by architect J. Pickering Putnam and built in 1884-1884-1885 by John Mack, Jr., mason, and John McDonald, carpenter, as the home of Dr. William Herbert Rollins and his wife, Miriam Walley (Phillips) Rollins. Miriam Rollins is shown as the owner on the original building permit application, dated July 25, 1884. Miriam Rollins purchased the land for 399 Marlborough on June 30, 1884, from Anna Powell Mason (Sears) Amory, the wife of William Amory, the eastern 20 feet of a 54 foot wide lot Anna Amory had acquired on February 10, 1881, from her son, William Amory, Jr. The land previously had been owned by a real estate investment trust formed by Grenville T. W. Braman, Henry D. Hyde, and Frank W. Andrews. The trust had purchased the land on March 1, 1872, from the Boston Water Power Company. 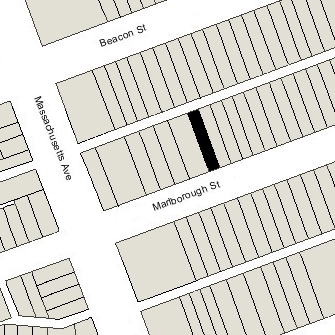 Click here for an index to the deeds for 399 Marlborough, and click here for further information on the land on the north side of Marlborough between Hereford and Massachusetts Avenue. By the 1885-1886 winter season, William and Miriam Rollins had made 399 Marlborough their home. They had married in April of 1882 and previously had lived at 112 Charles Street. William Rollins was a dentist and was a pioneer in the use of x-ray technology. When he and his wife lived on Charles Street, he had maintained his office at 28 Chestnut. 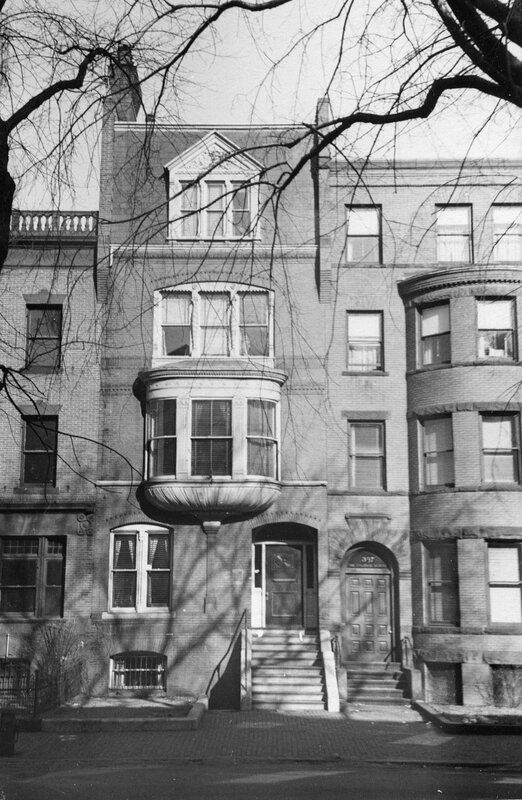 When they moved to 399 Marlborough, he moved his office to 248-250 Marlborough, sharing the office with Dr. Wilbur Bates Parker, who also lived there. Dr. Rollins continued to maintain his office there until about 1911. Miriam Rollins died in 1925. 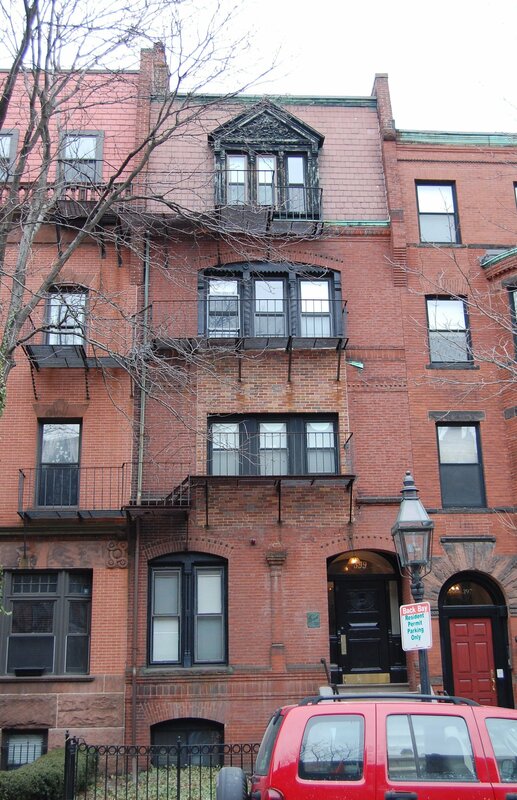 William Rollins continued to live at 399 Marlborough until his death in October of 1929. In his will, he left 399 Marlborough to the Smithsonian Institution. On July 16, 1931, 399 Marlborough was purchased from William Rollins’s estate and the Smithsonian Institution by the Chi Sigma Chi Corporation. It subsequently became the fraternity house of the Boston University chapter of Chi Sigma Chi. It remained there until about 1938. In 1939, 399 Marlborough was the Alpha Kappa Psi fraternity house. By 1940, it had moved to 164 Bay State Road. On December 18, 1939, the Chi Sigma Chi Corporation transferred 399 Marlborough back to the Smithsonian Institution, which held a mortgage on the property. 399 Marlborough was shown as vacant in the 1940 and 1941 City Directories. In April of 1941, the Holden Realty Trust applied for (and subsequently received) permission to convert the property from a fraternity house into a lodging house. In February of 1942, after the approval of the change of use had been received, Helen Elizabeth (Maclary) Baader, the widow of Albert Stanley Baader, as trustee of the Holden Realty Trust, acquired 399 Marlborough from the Smithsonian Institution. On the same day, the property was acquired from Helen Baader by Earl R. Westcott, a salesman, and his wife, Esther J. (Thrasher) Westcott, who operated it as a lodging house. They previously had lived at 11 Durham. They continued to live there until about 1949. In April of 1949, 399 Marlborough was acquired from the Westcotts by Inez Louise (Parkinson) Gundesen, the widow of Christian Niels Gundesen. Their two sons, Clifford Stanley Gundesen (a draftsman) and Lloyd Christian Gundesen (a student), lived with her. She operated it as a lodging house. The property changed hands, remaining a lodging house, and in April of 1956 was acquired by James J. Maher and his wife, Myrtle Ursula (Davidson) Maher, of Medford, who operated it as the Marlboro Arms Guest House. In February of 1966, James Maher applied for (and subsequently received) permission to remove the second floor oriel window, replacing it with four new windows and brick. In May of 1966, 399 Marlborough was acquired from the James and Myrtle Maher, by then residents of Hamilton, by Franklyn G. Bill and Sidney R. Handler, trustees of the C & S Realty Trust. It continued to be operated as a lodging house. In December of 2008, the trust transferred 399 Marlborough to Priscilla (Pittman) Bill, wife of Franklyn Bill, and Claire R. Handler, wife of Sidney Handler. On the same day they transferred the property to the 399 Marlborough LLC (Priscilla Bill and her brother, Baird Pittman, managers of record). 399 Marlborough remained a lodging house in 2017.